Large display. Cost Effective. Versatile. The Trojan Rotating Large Format Cart is highly manoeuvrable and a cost effective alternative to PACS review. Mobility allows positioning for individual user preference and is ideal as a shared resource. Ideal for operating theatres and radiology. 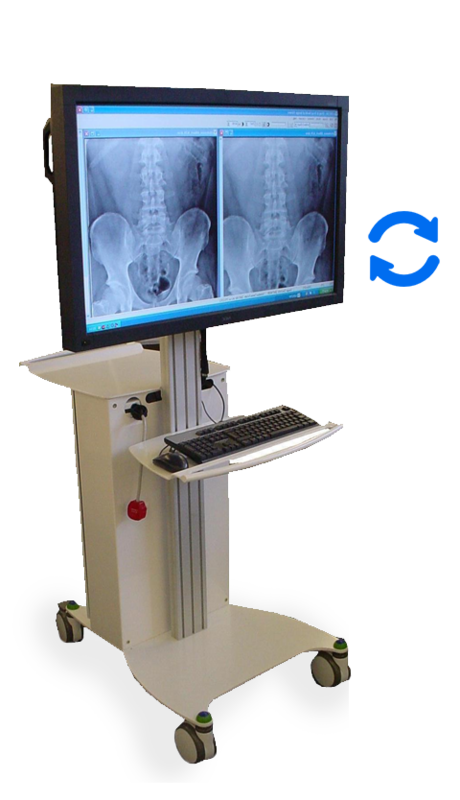 This Large Format Cart comes with a 40″ or 46″ high brightness, high contrast LCD with optional preset DICOM. Including optional slave display to rear for presenting and rotational display. The Trojan Rotating Large Format Cart is great for infection control with a sealed PC enclosure. It also has an optional protected display front panel for improved infection control.